Toss in some ingredients, out comes a haute cuisine dinner – it's like Jamie Oliver in electronic pot form. Pukka, lovely, nice one! Thermomix TM6 is a multi-function appliance that can effectively do the job of 20 other kitchen gizmos and all in the space of one slick and stylish design. It chops, it slices and it can fry or steam too. The cutting-edge machine will even knead and slow cook. Part advanced food processor, part mini oven and part AI chef, it’s a veritable culinary powerhouse. Basically, imagine Jamie Oliver transformed into a compact, electronic pot, unable to speak or run any more mid-market restaurant chains into the ground, but with his cooking skills intact. It's like a dream come true, right? 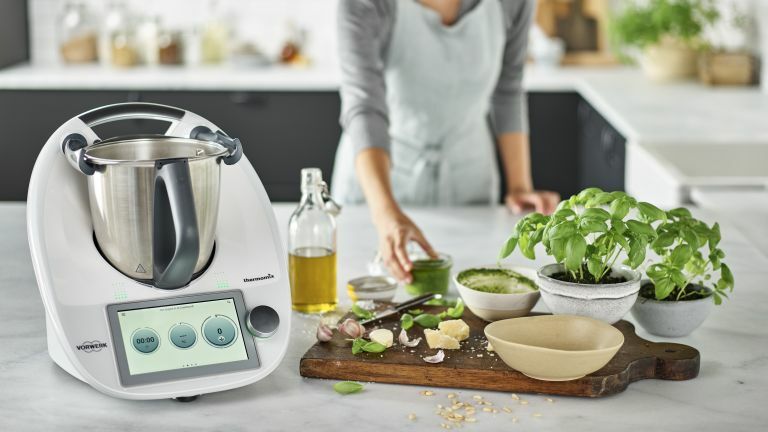 There are new functions galore aboard the Thermomix TM6, with a slow-cooking feature that can tackle even the toughest cuts of meat and turn them into moist, manageable mouthfuls. More advanced yet, the sous-vide function is perfect for tenderising not only meats but getting your veg into succulent shape. The high-temperature setting means that browning is a breeze, while even the production of caramel and toffee for desserts is within easy reach. Kitchens are meant to be functional places, but more often than not they turn into graveyards for dust-gathering appliances that seldom see use. Not so the Thermomix, which makes itself essential by amalgamating preparation and cooking chores into one single machine. This latest version looks like being a big improvement on its predecessor, the TM5, thanks to higher maximum cooking temperature. There's also an upgraded processor, larger touch-screen display, and improved weighing scale for more precise cooking. As well as a stack of essential accessories for getting through those tedious food prep tasks – including super sharp blades and whisk attachments – it comes with the option of accessing a vast online library of recipes. The colour screen guides you through these with simple, step-by-step instructions. Outside of the features listed above the unit is also capable of more conventional tasks, like basic mixing and producing purees. It can also be used for heating water, just like a kettle, thanks to a new 'Kettle mode'. Fancy producing your own yoghurt? The appliance can help you ferment ingredients and produce pots of the healthy white stuff. I'm starting to feel like I'm on QVC now. The nerve-centre for controlling its many features and functions is the all-new 6.8-inch, flour- and grease-proof touchscreen. If you’re always short on ideas when it comes to mealtimes then the other ace up the sleeve of the Thermomix TM6 is its integration with Cookidoo. Register to access this online service and it delivers in excess of 40,000 different recipes direct to the TM6. Working in tandem with the touchscreen you can swiftly navigate your way through creating everything from simple soups to heavenly hotpots.